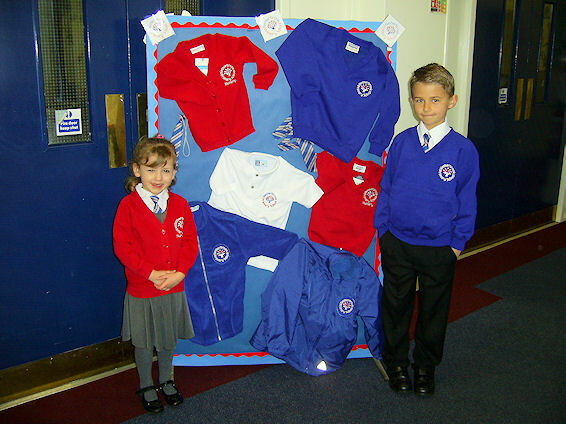 From March 2014 we will not carry a stock of uniform in school. It will be ordered on a weekly basis directly with our supplier. Our current Price List and Order Form can be found in the Forms section of our Policies and Documents page. Uniform can be ordered online directly from Ace Embroidery (external link). Nursery uniform is red. Our main school uniform is blue. Please make sure that you write your child's name in everything. Jewellery: Only one pair of stud earrings may be worn in school. These must be removed for all physical activities. No other form of body piercing is allowed. Watches may be worn from Year 3 onwards. No other jewellery is allowed.